Maloney Brothers Automotive Machine Shop at 2360 SE 82nd Avenue, 1976. This photo is a good reminder that not everything about the past was roses and good times; you can practically smell the smog in this picture. A year after this, i was ten years old waiting in a very long line at the Eastgate theater for Star Wars. Not only smog but the visual pollution of bill boards and overhead power lines! It’s hard for me to think of the 60’s and 70’s as vintage but I guess it would be the same as my fascination for the 50’s when I was in my twenties in the 70’s. (Did that make sense?) Lol. I’d bet that any adult that has lived here all their life doesn’t see anything wrong with this picture. B.C. Davis: Naw, the area was/is a dump but at least it’s getting better. Wow, I haven’t seen a First Interstate Bank logo in years! Note the Winchell’s Donuts sign half-hidden among the others there. Right before or 78Winchell’s was Terry’s Fish and Burgers. I went there as a kid. Across from this on the left side of the picture was a grocery store called Bazar which later became a K Mart in ’77 or’78. Dave Johnson: i won my bet. thanks. we should have brunch sometime at Taboo, i hear it’s classy. @ Linda Raab: That’s actually a First National Bank of Oregon sign — before it became First Interstate. @Bret: When Star Wars came out in 1977 the only place to see it in the Portland area was at the Westgate Theater in Beaverton. Brian: You are wrong. You are thinking of The Empire Strikes Back a few years later.And i was standing in that line as well. so check your facts and dont be so quick to call someone a liar. Also, just to be clear, I’m not saying that it never played at the Eastgate. Eventually Star Wars did play in other theaters in the area, but it was only at the Westgate for quite some time after it opened in May. Yes indeed, Brian, you were in a way, calling me a liar. why else would you make such a comment in response to mine? Did i say what month it was when i stood in line to see Star Wars? No. Did i say that it was The day it came out? No. All i said was in ’77 i was ten and waited in line to see Star Wars at the Eastgate. Im sure that it was less than 8 days before they Had to rethink just showing in one theater, let alone 8 months left of 1977. but you saw in my simple comment an opportunity to sound like you know more than someone else. I’ve known alot like you. The same type that try to back out of a misspoken comment rather than omit fault. just to be clear. That being said, lets hook up with Davis and Brunker for that brunch. peace. 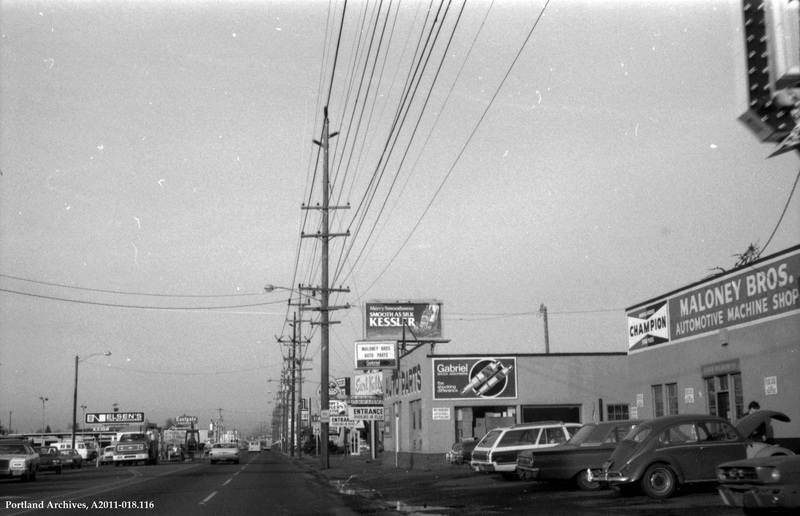 Well, almost 20 yrs living within 1-3 blocks (NE Fremont + SE Stark) of 82nd in 70’s-80’s+; Also the wires + smog (?) prob really good ol’ Orygun Grey Skies- all add to the character of ‘our town’ !! I believe !! …mud puddles in front of Auto Parts/Machine shop – prob verify the ‘grey-skies- !